We’d love your help. Let us know what’s wrong with this preview of As Right As Rain by J.M. Maurer. Though a don’t-fall-for-the-cameraman rule should b After finally landing her first job at a television station, meteorologist Makayla Reading is determined to make her mark on the world. With an ex she’d rather forget and no time for a new man in her life, what she needs is a true friend to help her deal with jittery nerves and her crabby boss who makes her life miserable. To ask other readers questions about As Right As Rain, please sign up. Makayla is a young meteorologist at a local television station. She knows she has to pay her dues and she’s on board with that. A snow storm is on the way and she’s on her first assignment when she meets Eli, her cameraman. The chemistry is immediate, but she knows she’s not ready for a relationship, not after what her ex did to her. So, she and Eli become fast friends. He helps smooth her rough edges on and off camera. But between her boss’ inappropriate comments and keeping a big secret, Makay Makayla is a young meteorologist at a local television station. She knows she has to pay her dues and she’s on board with that. A snow storm is on the way and she’s on her first assignment when she meets Eli, her cameraman. The chemistry is immediate, but she knows she’s not ready for a relationship, not after what her ex did to her. So, she and Eli become fast friends. He helps smooth her rough edges on and off camera. But between her boss’ inappropriate comments and keeping a big secret, Makayla’s life has gone from lonely to very complicated. Will she reveal her big secret to Eli and open her heart to love or will she be rolled over by the tornadoes in her life? I’m a big fan of J. M. Maurer and was so excited to hear that she wrote a new adult romance featuring a meteorologist. I couldn’t wait to dive in. True to Maurer’s writing style, there’s depth and serious sub-plots solidifying the romance between Makayla and Eli. Families of both main characters make great secondary characters and there’s room for a sequel. I didn’t care for the solitary POV (Makayla) but that’s a personal preference. I enjoy hearing the male POV in my romances nowadays. 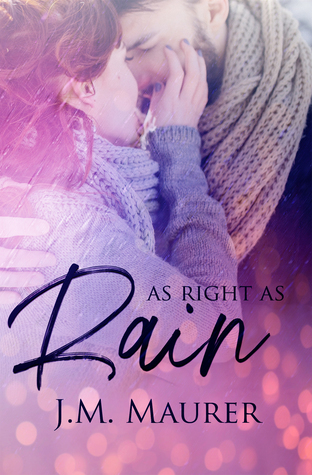 If you’re looking for a down-to-earth romance where the characters have real issues to work through, pick up As Right As Rain today. Makayla Reading is the new meteorologist in town and she hopes this is her big break to make something of herself. Although she definitely has her work cut out for her with her new boss Ed Richardson. Eli Barringer is the cameraman who is assigned to Makayla and when they meet sparks fly. Makyala is scared to get involved with Eli with mixing work and pleasure but she soon discovers that she can't stay away from him. Makayla soon learns the type of boss that Ed Richardson really is and she must de Makayla Reading is the new meteorologist in town and she hopes this is her big break to make something of herself. Although she definitely has her work cut out for her with her new boss Ed Richardson. Makayla soon learns the type of boss that Ed Richardson really is and she must decide what she wants to do with her life and when Eli is transferred to Cincinnati to spite her will she give up or keep fighting? I really liked Makayla and was interested to see what was going to happen to her this time and see what changes the author had in store for us. She has still naive in a way but at the same time you could see the influence her mom had on her and she was properly prepared to handle what came her way at the end. I liked that she truly saw the validity in what her work was and I loved how she stopped at the accident and I felt awful for how Ed treated her after that. I really liked Eli and the conversations he had with Makayla. I loved their trip to Oklahoma and how he got to see a whole other side of Makayla. I was so mad at what happened to him and his job but then I was a little mad at him after that for not keeping in contact with Makayla. She becomes friends with her Camera guy, Eli, and when Eli and Makalea go to Oklahoma for Christmas, their friendship turns to love. Only problems begin to show up once they return to Cleveland. The only thing Makalea truly loves in Cleveland is Eli. Otherwise, she would l Makalea left Oklahoma and took a job in Cleveland because she needed space from her parents, She loves her parents, but it’s time for her to spread her wings on her own. So she lands in Cleveland, working as a TV meteorologist. This story was interesting and inspirational and a little bit funny. I really liked Makayla and I loved learning the history that was mentioned when she and Eli went back home to Oklahoma. We all need a swoon-worthy man like Eli in our lives. I Loved him! The ending is great, with a happy ever after, but I hate to see these two go. The chemisty and connection these two have make me wish for another story with them. Good read! J.M. Maurer started working as a registered nurse in the Pediatric Intensive Care Unit where she cared for critically ill children, transported them from outlying hospitals, and even picked up overtime hours treating patients of all ages while inside a hyperbaric chamber. She loves to write about strong characters and their struggles in life. When not writing, you can find her spending time with fa J.M. Maurer started working as a registered nurse in the Pediatric Intensive Care Unit where she cared for critically ill children, transported them from outlying hospitals, and even picked up overtime hours treating patients of all ages while inside a hyperbaric chamber. She loves to write about strong characters and their struggles in life. To find out more about J.M. Maurer, visit her website at www.jmmaurer.com or sign up for her newsletter to learn about upcoming releases. She loves to hear from readers. You can email her at jmmaurerauthor@gmail.com or find her on Social Media. See JM’s website at: http://www.jmmaurer.com.